Bill Peters didn't know what to think when he saw Mike Babcock frenetically walking toward his table at the 2014 NHL Draft. Peters, named coach of the Carolina Hurricanes eight days before, worked the three previous seasons on Babcock's staff with the Detroit Red Wings. "He came over and said, 'Come here for a minute,'" Peters said. "I didn't know what was going on, but he was moving around like he was in a house on fire." Peters knew better than to stay put. When coach summons you, you respond. Something meaningful is likely happening. In an instant, Peters was standing, heeding the call from his mentor, curious and unsure why Babcock seemed so excited. Then he saw Ottawa Senators coach Paul MacLean and San Jose Sharks coach Todd McLellan standing where he was heading. Realization dawned immediately. 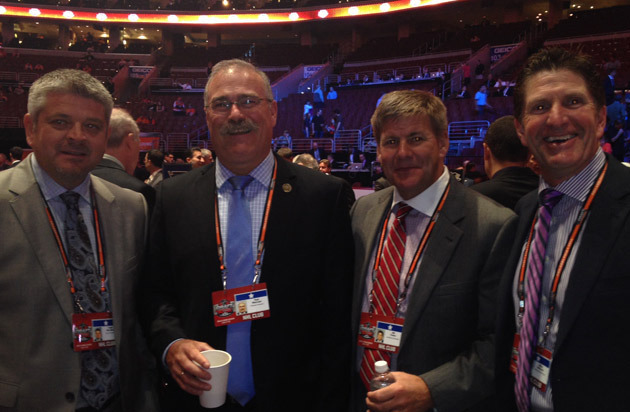 All the branches of Babcock's coaching tree were together in one place, on the draft floor at Wells Fargo Center, and Babcock wanted to have a moment with them. In the past six years, MacLean, McLellan and Peters have left Babcock's staff to become a coach in the NHL. Babcock is the only coach in the League with as many as three former assistants leading his own NHL team. "We're about developing people," Babcock said. "We look to hire people who are going to be head coaches." MacLean was on Babcock's staff for nine years, going back to his first season with the Mighty Ducks of Anaheim, before leaving for Ottawa in 2011. He won the 2013 Jack Adams Award. McLellan spent three seasons with Babcock before getting hired by San Jose in 2008, shortly after he and MacLean helped Babcock coach Detroit to the Stanley Cup championship. McLellan has twice coached the Sharks to the Western Conference Final and was a finalist for the 2009 Jack Adams Award. Peters worked for Babcock in Detroit from 2011 to 2014 before agreeing to coach Carolina this summer. He replaced MacLean on the Detroit staff. Many in the coaching profession believe the number of Babcock alumni as coaches in NHL would have been higher by now. The prevailing thought is former assistant Brad McCrimmon would have been running an NHL team if tragedy hadn't struck. McCrimmon was killed in the Lokomotiv Yaroslavl air disaster on Sept. 7, 2011. For good measure, Tom Renney, who was McCrimmon's replacement on Babcock's staff, recently took the job as president and CEO of Hockey Canada. "That's not a bad job either," Babcock said, laughing. Having gathered his protégés not far from the stage, Babcock reached into the pocket of his neatly pressed suit pants and pulled out his phone to document the moment. Peters, MacLean, McLellan and Babcock got in tight -- McLellan with his hands in his pockets, MacLean holding a coffee cup, Peters clutching a bottle of water -- and smiled as big as coaches allow themselves to smile. Less than a second later, a memento was created for each to cherish. "I'm proud of that picture, very proud," Babcock said. "I think it's important that people are allowed to grow. Those guys have all had a huge impact on me as a coach, but also me as a person. I hope they'd say the same about me." Babcock said he hires men he knows can be a coach, and he does so without concern for his job security even though his confidence in them is so strong he believes they could do his job, at least eventually. He doesn't care where they come from, as long as they are highly recommended. They don't have to have NHL experience; McLellan and Peters did not. "There is a Todd McLellan out there. Where is he? What's his name?" Babcock said. "There's a Mike Babcock out there. Where is he? What's his name? They're out there. You've got to find them and then you have to have enough [guts] to hire them." The process Babcock uses to find his assistants, to interview them, hire them, work with them, and help see them to the next stage of their career has helped him become one of the most successful coaches in NHL history. He entered this season with 484 wins and a .629 points percentage, third among coaches with at least a decade of experience. He has a .581 winning percentage in the Stanley Cup Playoffs and has never missed qualifying in 12 seasons as an NHL coach. He won the Stanley Cup in 2008 and reached the Final in 2009, only to lose in seven games to the Pittsburgh Penguins. In his rookie season as an NHL coach, Babcock's Mighty Ducks made it to Game 7 of the 2003 Final, losing to the New Jersey Devils. "He gives you the opportunity to coach, but at the same time he challenges you to be better," MacLean said. "He challenges you to not be satisfied with the way you've had success doing it in the past, so let's find and explore different ways to do the same thing so it could be just a little bit better. Those are the qualities with Mike that have led to this coaching tree." Creating that tree has been an exploration in enlightenment for Babcock. Babcock has been CEO of Detroit's coaching staff for nine years. He's had to make changes about every two or three years. He had to replace his entire staff, including his video coach, after last season. Each time, he was excited about the opportunity. Some people abhor change, believing it is never beneficial to disrupt or break up a good thing. Not Babcock. For him, change means he gets a chance at a refresh, an opportunity to seek new ideas from new people. "The great thing about people leaving is that they've had success and it's an opportunity for you to grow as you hire new people," Babcock said. "New people bring lots of new ideas. For example, when I hired [Grand Rapids Griffins coach] Jeff Blashill and Peters, lots of people thought I was crazy. Well, they're pretty darn good coaches. Blashill will be a head coach in the NHL for sure." This summer, five NHL teams called the Red Wings to inquire about Blashill for a coaching vacancy, according to Babcock; there were six vacancies in the League. Blashill was an assistant with Detroit for one season (2011-12) before moving to the Griffins, Detroit's American Hockey League affiliate. In his first season with Grand Rapids, Blashill won the AHL championship. 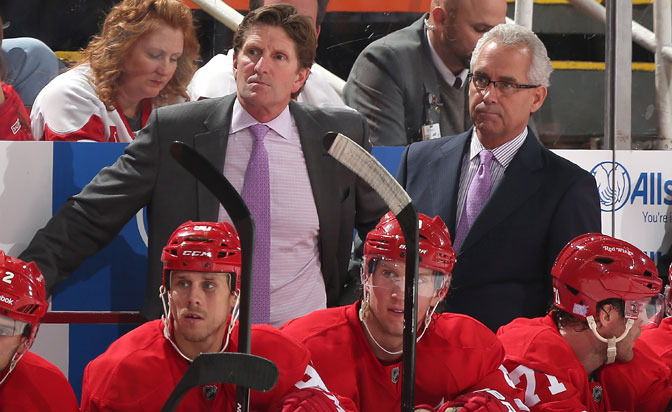 Last season, he won 46 games despite losing talented players to the injury-ravaged Red Wings. Blashill wants to stay in the organization for at least one more season, according to Detroit general manager Ken Holland. "Mike has identified some people that he thought were top people in college, junior or in the American Hockey League and brought them here," Holland said. "Mike has his own program in place that obviously has been a pretty successful program coming through the Western Hockey League, the American Hockey League, the Mighty Ducks of Anaheim, and now Detroit. He has been able to identify some younger people that he thinks have passion, have a work ethic, have that something that can develop into an NHL head coach. We have been the benefactors of that." Babcock finds his assistants by using a vast network of contacts. He talks to people in Canadian university hockey, the NCAA, WHL, AHL, NHL and Hockey Canada. He digs for information. "I really believe in the process and the network I have," Babcock said. "I was at the Memorial Cup and I was with Ron Robison, the head of the Western Hockey League; David Branch, the head of the Ontario Hockey League; and Gilles Courteau, the head of the Quebec Major Junior Hockey League. All I say is, 'Who are your best coaches?'" If Babcock wants to know what is going on at the Division 1 U.S. college hockey level, he calls Jeff Jackson, the coach at the University of Notre Dame. Babcock's son, Michael, plays for Fargo in the United States Hockey League, so he has several conduits there. Babcock is well-connected everywhere in the hockey world he needs to be connected. Holland said, "It's not like we're guessing and making these decisions based upon a quick interview." Babcock's interest in coaches goes beyond up-and-comers. 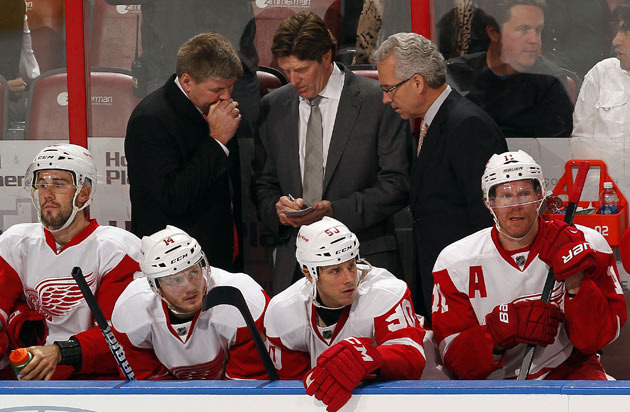 He has been known to invite recently fired coaches to work with the Red Wings on a just-in-case basis. Ken Hitchcock was asked to join the Red Wings after he was fired by the Columbus Blue Jackets and before he went to the St. Louis Blues. Hitchcock passed on the opportunity. 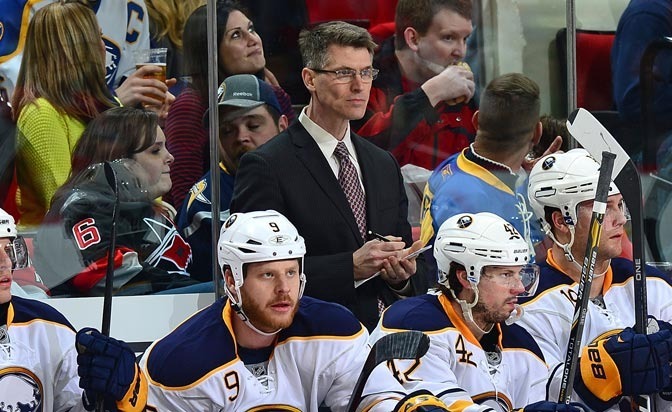 Ron Rolston arrived last season after losing his job with the Buffalo Sabres. "You're always looking," Babcock said. "Not only are you interviewing them, you're gathering information. You're trying to be up to date on who is available." When he finds someone he likes, Babcock makes sure he gets to know as much about that person's background as he can before interviewing him. "I'm not looking for the best interview," Babcock said. "I'm looking for the best coach." Holland said he doesn't interfere with Babcock's search process. "Probably earlier on I was asking more questions," Holland said, "but after you hire two or three people and within two or three years they're NHL coaches elsewhere, you listen." When it comes time for the interview, Babcock uses his wife Maureen and children Alexandra, Michael and Taylor as his scouts. Tony Granato, hired as an assistant this summer, saw the Babcock family experience first-hand. "I had a great day with them by his house," Granato said. "We went to breakfast with the family." Jim Hiller, also in his first season with Babcock, met with one of Babcock's daughters when he interviewed for the job. "The three of us spent time together as part of the day," Hiller said. Babcock said, "I'm looking to see what kind of man I'm hiring because smart people who can talk to people have a chance. If you can't do that, you have no chance, in my opinion." Granato said family has to factor into the decision because of the demands of the job. "We're going to spend more time together than he's going to spend with his wife," Granato said. "The same thing goes for my family. It's reassuring to the family to get to know the people your spouse is spending endless hours with." Hiller and Granato are in Detroit because of recommendations Babcock received from his network. Hiller was coaching with the Tri-City Americans in the WHL for the past five seasons. Babcock has a number of connections in the league as a former coach there. Robison, the WHL commissioner, is his brother-in-law. Babcock heard about Hiller's credentials through his contacts, but his choice was cemented after a conversation with Dallas Drake, who played for Babcock with Detroit. "Dallas Drake is as good a man as there is," Babcock said. "He won a Cup with us. He knows what it takes. He knows people. When he played for us he was the first guy in the room every day and we'd have a coffee every day. He had a great read on the team. If Dallas Drake tells me he's the guy, I'm believing him." Hiller said he made initial contact with Babcock, and Detroit's opening was the only one he chased, largely because of Babcock's record of having assistants become NHL coaches. "People always look for other people who are part of winning organizations because they're winning people," Hiller said. "Mike's track record is pretty incredible." Granato joined Babcock in part because of recommendations from Pittsburgh Penguins forwards Sidney Crosby and Chris Kunitz, who played for Canada at the 2014 Sochi Olympics. Babcock coached that team to a gold medal. 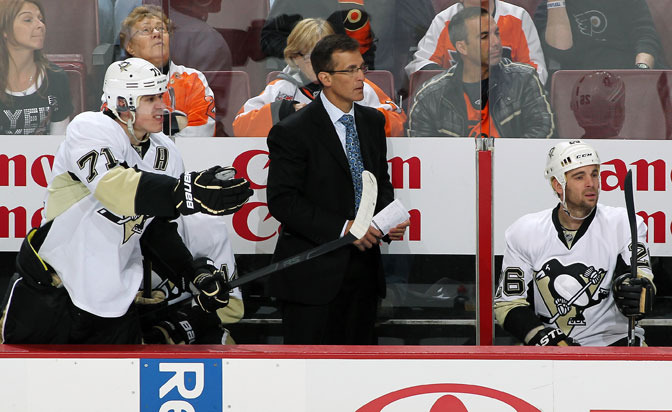 Granato was an assistant coach for the Penguins for the previous five seasons. "Sidney Crosby and Chris Kunitz told me Granato is a big-time coach, and then I phoned [former Penguins general manager] Ray Shero, and I phoned everybody Tony ever knew," Babcock said. "When I went to the Olympic ring ceremony in Vancouver, a whole bunch of players were there, we're at Joe Fortes on the deck having a few beers and I went through a whole bunch of coaches. If they say, 'He's OK,' and they really liked him, you're pursuing it." Andrew Brewer, the third new assistant with the Red Wings this season, came to Detroit from Hockey Canada. He was Babcock's video coach in Sochi. "Mike worked with him hand-in-hand," Holland said. "The people at Hockey Canada were singing Andrew Brewer's praises." Holland said he and Babcock felt Brewer was the perfect fit to replace Keith McKittrick, who left to become an assistant with the Portland Winterhawks of the WHL. "I think he'll fast-track my improvement as a coach and even as a person," Brewer said. "Just being around [Babcock] will make me better a better coach. He made me a better coach and hockey person in the 18 months to two years I worked with him leading up to Sochi." Babcock used a similar process to find Peters several years earlier, even though they coached together earlier in their careers. Peters was Babcock's assistant with the Spokane Chiefs of the WHL from 1996 to 2000, but Babcock said he didn't realize Peters' potential to be an NHL coach at that time. It took conversations with New Jersey Devils coach Peter DeBoer and former Ontario Hockey League coach and executive Mike Vellucci to convince him. Vellucci is in his first season as assistant general manager of the Hurricanes. "Pete DeBoer told me to hire Bill Peters," Babcock said. "Pete had been with him. Pete had coached against him in the Memorial Cup Final. "The more you talk, the more you ask questions, and the more you're interested in information the more names you get. The more questions you ask, the group gets smaller and smaller and smaller and then you decide who you're going to interview." Babcock's network has grown since he arrived in the NHL in 2002. Twelve years ago, he felt he needed a former player and a veteran NHL coach on his staff, so he hired MacLean and Lorne Henning. Babcock doesn't think that way anymore. "You don't have to have worked in the NHL," Babcock said. "Look at [Vancouver Canucks coach] Willie Desjardins, [Pittsburgh Penguins coach] Mike Johnston, Bill Peters; they're career coaches. I think there are tons of advantages Tony Granato has over some guys because he's played in the NHL for so long, but he's a good coach because he's become a coach, not because he played in the NHL. "Kris Draper asked me the other day, 'Do you think [Tomas] Tatar even knows Granato played in the NHL?' If you're not a coach and you don't make sense they ain't listening to you." To be an assistant on Babcock's staff you have to do one specific thing. "I want you to have a new idea every day, and I want you to fight for your idea," Babcock said. "I try to hire people that are going to bring change. I've got that right in their job description." It's all part of Babcock's R&D philosophy, something he's famous for among his assistants. "Rob and Do," McLellan said. "That's his R&D. That's his research and development." Babcock gets ideas from his assistants and then challenges them to explain those ideas and show how they work. If an idea is successful, he takes it and molds it into his own. "I was speaking at the draft and I said I couldn't remember if it was Paul MacLean's line or Todd McLellan's line or Jeff Blashill's line, it doesn't matter to me because it's my line now," he said. "You find something, you steal it, you make it better, you make it your own, you evolve. Whoever's idea it was, if it works, it's the new Red Wings way." McLellan said one of Babcock's greatest strengths is he always wants to know if there is a better way of doing something. "One of the things that I discovered is that it's almost like being a lawyer," McLellan said. "Create a case and show him why something different might work. As soon as you gain his trust he's very open to ideas and thoughts. He wants to be debated with." Peters said, "He's not there to have yes-men. When you don't like something, bring it up, talk about it, explain why you don't like it, but you better be solution-based. You better have a solution and a better way. You better be right." MacLean, McLellan and Peters believe in Babcock's R&D philosophy so much they have robbed from him. "Why wouldn't you?" McLellan said. "When I walk into our coaches room, a lot of times the last opinion that is heard will be mine because I don't want to influence [the conversation]. I want to know what they're thinking. When you're not asking and you're not listening, you don't get the value from some very good hockey minds." Work with Babcock and you become his partner. Leave and you become his sounding board and scout. "Now you have colleagues, you have guys you can call," Babcock said. "If I call Todd McLellan to ask him a question, I'm getting an answer. You build up your information network, you have a better chance to make better decisions, I believe." It's a two-way relationship because Babcock always fields calls from former assistants asking about future opponents. MacLean said he and Babcock share information even though they're both in the Atlantic Division. "Let's face it, Mike and I have gone through a lot and been together a long time, so as long as our teams aren't playing one another we're going to share information," MacLean said. Peters said expects to have regular communication with Babcock throughout his first season with Carolina. "It won't be as open as say if I was in the [Western Conference], I would think, but when we're playing teams and he's playing teams after us I would expect him to call me to talk about what I've seen, and that will go both ways," Peters said. "We're smart enough to know what can be shared and how much information can be given out. There will be times when it'll be as simple as, 'Do your own homework.' If I have some questions about the League and things I want to run by him, I'm sure he'll take the call." MacLean said, "That's part of being on the coaching tree. The 'rob and do' is always important, but you can't 'rob and do' if you're not talking to people." The coaches on the bench with Babcock will tell you there's no one better to work with or rob from. Three Babcock acolytes have an NHL job to prove that assertion. Blashill might next season. Hiller could be in line after that. Brewer wants to follow. Their boss is rooting for them. "I was pumped to take a picture with Peters, McLellan and MacLean at the draft," Babcock said. "It makes me proud, but what it also does is it shows you how people get better. Isn't that what coaches are supposed to do?"